Reports and stories from trips, planning of gatherings, questions about how to get there! 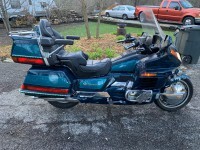 Motorcycle: 1987 GL1200A Aspencade Sold in 2018 to a collector. It is never to early to start thinking about the 3rd Annual East Coast Gathering. BPM Jim, Bluethunder and myself have volunteered to put together a great ride for next year. The consensus reached last weekend was to plan next years gathering in the Maggie Valley or Little Switzerland areas of North Carolina. I would love to make a full week of it but understand others have limited time frame, We are looking for suggested rides from our fellow members. The plan for next year will be to have each days ride available in GPX format. The rides will be double checked for accuracy so that we don't experience a surprise like we had this year. If you plan to attend and have a suggested ride, post it here or send it via PM to any one of the planning committee. We will try to have more routes than we need so that the group can decide on which routes to ride. We also discussed riding in smaller groups as it is very difficult to keep 18-20 riders in a manageable formation. We could have 2- 3 groups heading out on the same ride at 10 minute intervals with planned stops for lunch. Feel free to make any and all suggestions. Al, Maggie Valley is certainly a great area to Ride in but personally I found the hotels to be a little on the high side. I don't know anything about Little Switzerland. In past years, I have stayed with groups in Robbinsville and Franklin, NC and was happy with the prices and certainly the area to Ride is fantastic. The week of Oct 16th I'll be in Bryson City area of NC and wouldn't mind doin' some pokin' around to try to get a handle on next years prices. If you can give me an approximate time frame and number of folks that might be expected, that would help. I understand it's just a wild-hair guess at the moment. This being a 'very buzy' time for the hotel business in Bryson City I was able to find nice hotel accommodations for just under $100/night INCLUDING taxes. Usually the way it's worked for us in the past, the hotel will block off a set number of rooms for out group until 2-3 weeks before the date we plan to be there. That gives everyone time to make reservations in an area of the hotel where we might be grouped together. Once the 'holding date' is past, it's every man for himself. Thanks Larry. It would be great for you to do some sleuthing for us. I will contact my other 2 compadres and try to settle on a date. Most likely it will be around the same time in September. I’ll send you a PM after a talk to Brian and Jim. I put a place holder in my 2019 calendar for the week of September 19th to the 26th. I am not familiar with the areas mentioned but we have good friends that always go camping down in Asheville NC which seems close to the Maggie Valley area mentioned and they love the area. They mention the great scenery and plenty of craft breweries for after the rides. Hopefully I can convince the wife to schedule a vacation for that week and we can join the ride and meet everyone. (1) it is pretty much centralized located on the Blue Ridge Parkway. We could one day go north towards Skyline Drive, go south towards Maggie Valley, or ride in the area. Because of this location, it allows different rides for the various days. Fuel and food are nearby. (2) Hotels are readily nearby without costing an arm and leg. Hampton Inn (my personal favourite and one can't go wrong) are nearby. (3) We could also stay at Little Switzerland Inn. They have plenty of room for us, are motorcycle friendly, has two restaurants on-site (both very good), a t-shirt/knickknack shop, a real estate office (for those that want to buy a home) and an ICE CREAM store! (4) Route 206 and 206A rival the Dragon are within spitting distance of Little Switzerland. As far as the dates, the second weekend after Labour Day seems to work out well. and an ICE CREAM store! - You buried the lead! I've already identified motels. Just gathering information to see if they could accomodate us. Will post shortly... most likely in a separate thread. I think it best to have only one thread. We had 2 separate threads this year and some people got confused. BTW, when you have a hotel lined up let me know. I am looking to start creating routes. I think one day a ride to Maggie Valley would be great. It is only about an hour and a half from Little Switzerland. Larry brought up how nice the motorcycle museum was there. I will create a route for that destination as one to be considered by the group. Al, a route should be planned to include 226, 226A and Route 80. I agree that one thread be started to contain information, motel, attendees, etc. This thread however, should not be it. Maggie Valley would be a nice day ride and culminate with a visit to the motorcycle museum. I agree - let's have this one "planning" thread, and then once things are solidified, we can have the "announcement" thread that includes everything including hotel info. The two separate threads for this year did cause a lot of confusion for people. Maggie Valley would be a nice day ride and culminate with a visit to the motorcycle museum. Justa heads up,... Wheels Through Time Museum,... Ya just can't do it justice trying to see it at the 'end of the day'. Three or four hours, you'll still wanna come back. I personally have been there EIGHT TIMES and STILL go again when ever I'm in the area. 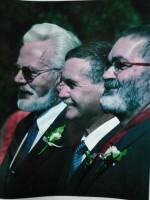 Dale Walksler (owner and curator) is always changing things around. Always new exhibits and different bikes out front. If Dale is around when you visit, (and quite often he IS) if he see's your interested he'll ask, "Wanna see the shop"? You can spend an hour in there easy. It sounds like a great event you guys have started. Reviewing all the GoldwingDocs rides that have already happened, what were the highest posted speed limits everybody encountered as a group on the official rides? Do you typically stay off the Interstate highways on the planned routes? Just wanted to throw out a couple of ideas for rides in the NC/TN area you are looking at for the 2019 Gathering. 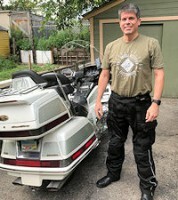 Two weeks ago I was road captain for 9 others in my riding group that rode Cherohala Skyway, Tail of the Dragon, and the Moonshiner 28 among other back and connecting roads. All great rides in the area you are considering. We stayed in Maggie Valley at the Maggie Valley Inn/Convention Center which has a restaurant and lounge for those 'after day ride' get togethers. We traveled Rt 19 from Maggie Valley to Rt 28 to run the Dragon, and then took some back roads to reach the Skyway. We returned via the Great Smokey Mt Expressway because of getting late in the day. There are many great back roads, good roads, in the NC area that would make fantastic day trips. The Wheels Through Time museum in Maggie Valley is a definite must see. There is white water rafting in the area if you are up for a little wet travel, and some really great BBQ in this area. Looking forward to visiting this area again. One of my favorite destinations. Also take a look at Rt 421, The Snake, near Mountain City NC, right across the TN/NC border. Not too far from the Little Switzerland area you all are considering. Looks like about 70 miles with some great roads to get there. The BRP should be the main throughway for our rides. That is, we ride the BRP to get to where we want to go. For example: A day ride north could be in the Little Switzerland area. 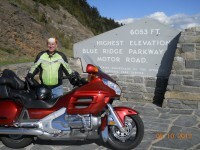 Another day ride (south), riding the Tail of the Dragon and surrounding area. The third day ride would be in the area between the two. That would mean that our "home base" aka motel should be located between the two locations, preferably in the middle. That would be in the Maggie Valley/Deadwood area. I am currently investigating motels, rates and ability to handle 20 bikes. Make sure to check out the Maggie Valley Inn/Convention Center. Rooms are comfortable and great Tiki bar for after ride. Restaurant in the hotel, too. Em, thanks for the great suggestions. The Inn and conference center look like a nice place. I like the idea of staying in the Maggie Valley area. It is centrally located in some great riding areas. I am going to start working on some routes that we can choose from. Looking forward to seeing you next year at the gathering God willing and absent a hurricane. I checked the reviews on the MGCC, and they don't read too well. Granted most places in MV are 2 or 3 stars, but have you stayed in the Convention center lately? If you have and you liked it, then I will pursue the possibility of staying there. First week of October, 10 of us stayed at the Maggie Valley Inn as our launching site for our rides in the NC/TN area. While I admit it is not 5 star lodging, it was clean and convenient, and they treated us great. The restaurant food was good, the Ti-Ki bar was a nightly gathering spot for not only us but lots of locals. This is the second time in the last 3 years I have stayed there, and always a good location and respectable lodging. One downside for us though was breakfast was not until 8. Sometimes we wanted to head-out earlier, but in that area you always have to contend with the early morning fog. You are right about the lodging in the Maggie Valley, not many 4 - 5 stars. There are no chain hotels, and that may be because of local regulations. Check Silva, NC, which is 30 minutes from Maggie Valley for the chain hotels on Rt 74, the Great Smokey Mt Expressway. Looking forward to visiting this area again. It is in my top riding destinations. Great riding anywhere in this area. I cannot contribute much so far from the potential action, but, to move a "mob", break them into packets, set a speed average, and max speed, for each section. Then set the packets off at some time intervals. say five to ten minutes. Allow front to rear liaison - when turning a corner, the first waits until it is clear for the following rider to see where the turn is heading, and then proceeds. this is a way of letting everyone ride together, and it doesnt matter if someone stops along the way to have a drink of water etc. Hope this helps. The world is not going to finish today, as it is already tomorrow in Australia and New Zealand, and other islands of foreign nations such as Guam and Samoa. When you guys fine a motel as home base, please check out campgrounds that are close too. Will have my pop up with me. I have been on most of the suggested routes and they are all good, especially the US 421 run from Boone to Bristol through Mountain City. Want to try US 321 someday, too. Can't go wrong with the BRP but perhaps not ideal for a long large group ride. Accommodations around Maggie Valley vary greatly but it is not far to Bryson City, Cherokee, Asheville and I-40. On up the road Boone has a fair selection of lodgings, too. Anyway, looking forward to it! Well, looks like I've missed a lot here! Been working my tail end off since the last one. Looking forward to the trip (just not sure I'm quite ready for the "Dragon"). Making sawdust with 100% efficiency!